General Description:White bryony is an herbaceous perennial vine with climbing stems that grow 12 feet long, or more. It has thick, fleshy, light yellow roots. Stems have long curling, not branched tendrils and the flowers are from leaf axils. 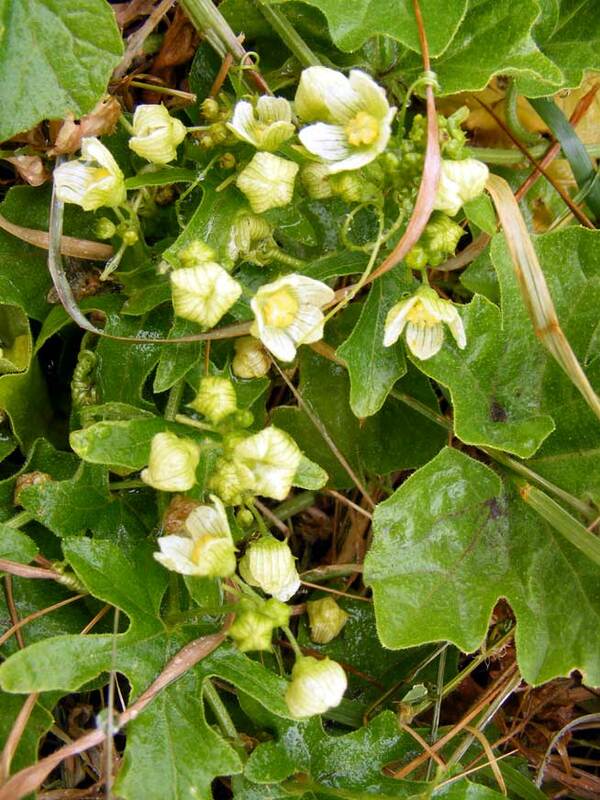 Flower Description: White bryony is monoecious, separate male and female flowers are found on the same plant. Flowers are greenish-white and up to 0.5 inch across. Leaf Description: Leaves are simple, triangular, alternate, broadly toothed and 3 to 5 lobed. The upper and lower surfaces have small white glands. Stem Description: White bryony stems are vines that can grow over and blanket other plants. Fruit/Seed Description: White bryony has black mature berries with 3 to 6 ovoid to oblong seeds in each one. The berries are especially poisonous (though all parts of the plant are).